Two classic Bedford CA panel vans. Homepage. This page: A black and white street scene featuring a number of old vehicles. 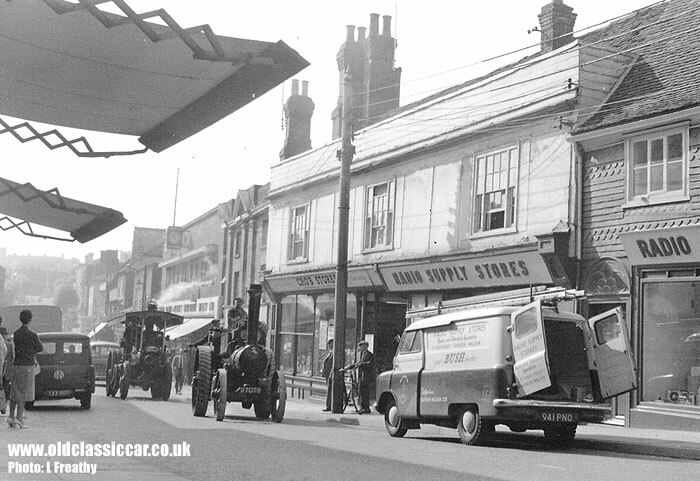 Thanks once more to Les who dug out and sent over this image from his own collection, featuring Bedfords and steam traction engines in what looks like Saffron Walden high street, presumably in the 1960s. Both Bedford vans are examples of the classic CA panel van, once a common sight but now quite a rarity. The nearest Bedford, registration 941 PNO (NO being an Essex issued number), looks like a Mk2 Bedford CAS (S for short wheelbase) to me, and belonged to the shop outside which it is parked - Radio Supply Stores, who were 'radio and television specialists' and also the local 'BUSH dealer'. A Saffron Walden telephone number appears twice on the van, re-inforcing the believed location of this shot. Note the array of ladders on the roof, no doubt to enable the installer to fit a TV aerial to his customer's roof if required, and the knobbly Town and Country type tyres fitted to the rear wheels. Further down from the electricals shop is Cro's Stores, outside which two hatted gentlemen, one with cycle, admire the two passing steam vehicles. Another Bedford CA can be spotted on the left of this shot, driving away, with a rival panel van, this time from Ford (a 400E) heading towards the photographer at a leisurely pace, behind the second steamer. The nearest engine is registered D 7078, and is an example of Aveling & Porter according to Les. A bit of a search online shows that this steam engine, built in 1913, is very much still in operation. Photographs of this engine at recent events can be found on the steamscenes website. I'd be very surprised if either of the Bedford vans shown here survive though!! Panel vans usually get a real hammering, often meaning that basic vans are the rarest of all, with cossetted campers based on the same underpinnings, tending to survive in much greater numbers. A couple more signwritten vans from Les' collection can now be found on this classic signwritten vans page.